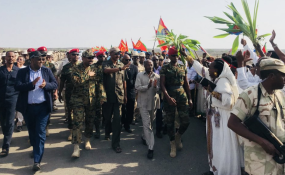 Prime Minister Abiy Ahmed and President Isaias Afwerki at the official opening of the Debay Sima - Burre border point. This month, Ethiopia reopened its embassy in Asmara, the capital of Eritrea, capping a series of historic diplomatic breakthroughs between the neighboring countries, after nearly two decades of hostilities. This rapid thaw in frozen relations contains enormous potential for peace throughout that long-embattled region. The Horn of Africa has been the site of geopolitical contestation for a century and a half involving European colonial powers, Cold War adversaries, counterterrorism efforts, U.S./China/Russia rivalries, and Gulf state power plays. The rapprochement between Ethiopia and Eritrea, led by Ethiopia's new Prime Minister Dr. Abiy Ahmed and Eritrean President Isaias Afewerki, opened travel and phone services between the two countries, allowing emotional reunions among families separated for twenty years. It also provides an important reminder of an earlier era, when the United States on occasion would use the full weight of its diplomatic capabilities and global influence to help secure a peace deal in Africa. The last major U.S.-led mediation in Africa, one in which I participated, was the very same Eritrea-Ethiopia peace deal the two heads of state finally decided to implement, eighteen years later. In 1998, an extremely violent border war between the two countries erupted, quickly becoming one of the deadliest in the world, with stakes in human terms that had few global parallels. President Bill Clinton decided that, given the good relations the U.S. had with both countries, his administration would be well positioned to help prevent a tragedy. The U.S. partnered with the Algerian government, which chaired Africa's continental body that year, and set out to mediate between two heads of state that had simply stopped communicating. President Clinton named his first National Security Adviser, Anthony Lake, to be the U.S. Special Envoy. Lake was closely backed by a number of key people, including then-Assistant Secretary of State for Africa Susan Rice, successive National Security Council Africa Senior Directors Joseph Wilson and Gayle Smith, U.S. Ambassador to Ethiopia Tibor Nagy (recently named the top Africa official in the State Department), and a tight group of Defense Department personnel. As the team's political adviser, I traveled with Lake, two Pentagon staffers, and our Algerian counterparts for two years, conducting shuttle diplomacy led by Lake between the two countries until they finally signed a ceasefire and a subsequent peace agreement, silencing the guns. The agreement occurred just when Ethiopian troops were massing for a march to the Red Sea, which would have resulted in a spiraling of death rates and likely led to a famine, threatening the lives of millions. The agreement resulted from good old-fashioned diplomacy and leverage, the kind of all-in effort the U.S. rarely undertakes any more in Africa. During the better part of the last two decades, the African Union and African sub-regional organizations have demanded, rightly, to lead any peace process in Africa. "African solutions for African problems" became the widely accepted mantra. As this regional leadership became more routine, the U.S. has struggled to find its role in African peace efforts. No longer leading direct mediation efforts, U.S. influence has diminished, and no new strategic approach has filled the void. What is missing is a comprehensive U.S. approach to supporting peace in Africa, a preventive framework that could save billions of dollars now spent cleaning up war-induced disasters. The U.S. now spends those billions treating the symptoms of crises through necessary peacekeeping missions and humanitarian aid, placing very little focus on addressing root causes. A more strategic and cost-effective U.S. peace strategy in Africa would include the deployment of experienced peace envoys to support African-led mediation processes. For example, a major African-led negotiation is attempting to resolve the bloody and deadly war in South Sudan, without any high profile, high impact U.S. diplomatic participation. Contrast that to an earlier era when President George W. Bush successfully deployed former Senator Jack Danforth as his special envoy in support of earlier African-led negotiations. However, the comparative advantage of the U.S. in this era should focus on how best to influence the governments and rebel leaders who are stoking conflict, as well as their domestic and international commercial collaborators. Those most responsible for war-related atrocities are also usually the same officials and profiteers looting the abundant natural resources that these countries are blessed – or cursed – with. Because the looting occurs in U.S. dollars, laundered through the global banking system, the U.S. possesses unique leverage on those fueling war. The U.S. Treasury Department has begun moving in that direction, utilizing a combination of highly consequential policy tools including sanctions directed against rights-abusing networks (not just individuals), anti-money laundering measures, and anti-corruption sanctions under the Global Magnitsky Act. Using these tools might not be as dramatic as when the United States mediated the end to one of Africa's deadliest wars back in 2000. However, if these tools of financial pressure are escalated in close coordination with enhanced U.S. diplomatic efforts to begin to alter the calculations of those stoking and profiting from conflict away from mass violence and corruption and towards the rule of law and better governance, then the impact in lives and money saved will be incalculable. John Prendergast is Founding Director of the Enough Project and Co-Founder of The Sentry.